As a custom glass beveler, I take patterns or templates, cut and edge the glass, then generate a bevel to the artists’ instructions. My studio does not offer pre-beveled clusters. Because of the costs involved in custom beveling, original work or one off designs is advised. Custom bevels will add a distinctive character to your finished project. The standard bevel is 1/2 inch in width on 1/4 inch glass. Some of the older restoration bevels measure from 3/16 inch to 7/16 inch in width. The glass was also a little thicker and sometimes varied throughout the whole window. I cannot bevel anything wider than 1 inch because the friction on the smoothing stone is so great that it makes it difficult to hold onto the glass. If you have questions concerning custom beveling please do not hesitate to contact us. All custom hand beveled glass is charged by the inch. I am happy to quote on 1 – 2 pieces or a complete beveled window. I have no minimum order. In order to calculate an accurate quote I need to know the glass thickness, bevel width, and total number of inches. I use United Parcel Service for shipping and use a packing system employing a double box with Styrofoam peanuts, bubble wrap, and 1/8 inch stretch foam wrap. To date I have never had any breakage due to improper packaging. A bevel is a ground and polished surface which, when measured in degrees, is an angle which is greater than 0 or less than 90. A bevel measuring 90 degrees is considered an edge. When two beveled surfaces meet, a straight or curved line is formed at their intersection. This junction is called a mitred line. A breakline is a straight or curved line which is generated when the beveled surface meets with the top surface of the glass. The secondary breakline is a straight or curved line which is generated when the beveled surface intersects the edge of the glass. The majority of all bevels are generated on glass ranging in thickness from 1/8" to 1/4", depending upon the particular application. A beveled mirror, for instance, will usually have a 1" to 1 1/4" bevel because this wider beveled surface has been added for aesthetic considerations. Most of the mirrors are beveled on thicker glasses because their square footage is greater and requires a thicker glass to reveal crisper breaklines. Thicker glass also has more structural strength and will show less distortion. The smallest bevels may be seen on antique watch crystals. Most watch crystals are beveled on 1/8" glass. Their beveled surface measures roughly 1/8" to 3/16" in width. These are examples of bevels used as decorative surfaces. The most extraordinary usage of bevels is when they act as a prism to refract white light into the full color spectrum. The refraction and reflection of light as it passes through the surface of the bevel within a beveled glass window, appears magical. As white light is transformed into its spectral components, a visual understanding of the mathematical principals of Snell’s Law of Refraction and Reflection can be fully appreciated. In a beveled window a straight or curved bevel will cast a spectral shadow many times greater than the length of the original bevel. If a beveled window measures four to five square feet in surface area, the prismatic effects within the interior of the room can be ten fold. Another aesthetic quality of a beveled glass window is the view which is perceived while looking through the bevels. As the point of view is moved ever so slight, the movement from what is being viewed from the outside, traverses back and forth along the length of the beveled surface. Sometimes the image is inverted yet in other views the image is in reverse. This quality is best described as an optical effect. If a beveled window has several hundred inches of beveling throughout its design, the optical effect is greatly magnified, giving the window a jewel-like appearance. There are four basic steps in the beveling process. The first step is called roughing, and as the name implies, the beveled surface has a very coarse look to it. This step shapes the bevel and is designed to grind the glass off at a very fast rate. 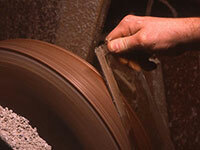 The roughing of a bevel is done on a machine called a Roughing Mill. The machine stands three feet high, with an outside measurement of 20" x 20". On top of the mill is a 24" cast iron wheel which is mounted to a 2" diameter vertical shaft. As the wheel spins an abrasive, silicon carbide, is pre-mixed with water to form a slurry, which is dripped onto the spinning wheel. Newer wheels have synthetic diamonds impregnated into the surface so that water is the only additive needed to complete the grinding process. Smoothing is the second stage of the process. This is done on a Smoothing Mill which is identical to the Roughing Mill with the exception that the wheel is not made of cast iron but of aluminum oxide. The Smoothing Stone measures 24" in diameter and weighs 275 pounds. At the center of the wheel it is 3" in thickness, tapering to 2" at the outer edge. During the grinding process, water is directed to the center and because of centrifugal force, is spread over the surface of the stone. When finished with the "stoning" process the bevel has the appearance of an acid-etched surface. This secondary step, in the beveling process, is considered to be the most crucial in determining the quality of the finished bevel. Some of the noticeable mistakes, if smoothing is rushed, are multi-facets, mis-aligned mitres, or deviation of the bevels width. The third step is a semi-polishing stage which is done on a solid cork wheel. 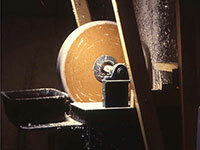 A mixture of water and pumice are brushed onto the wheel as it is spinning. This is termed charging the wheel. This abrasive action removes the minute striations and slight imperfections left by the stoning process. A couple of terms associated with this process are White Wheeling or Corking. Modern beveling machines use synthetic wheels which has the abrasive medium mixed into the fibrous material. The fourth step is termed the Final Polish. The wheel used in this step is made from felt. A mixture of Cerium Oxide and water is brushed or charged onto the spinning wheel. The process is considered a micro-abrasive action, and when properly done, will polish the bevels surface equal to that of the flat surface of the glass. Upon close inspection of the bevel, there should be no irregularities or distortion. If mistakes are present, the last two processes need to be repeated. This woodcut shows the glass casting process. 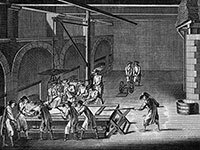 Denis Diderot recorded the process in his Trades and Industries, "Encyclopedia" circa 1713 – 1784. The plate shows a square crucible which is where the molten glass is being poured into a mold. The roller then flattens the glass into a consistent thickness between a quarter to half an inch. Up until the 1930’s, this is how plate glass was manufactured. After the plate glass has been annealed, it is then removed into another room in the factory to be surfaced. The surfacing technique involved a multi-staged process which by using finer abrasives grinds the surface of the glass to a highly polished finish. In Diderot’s plates # 253 and 254, a hands’ on process of surface grinding can be viewed. After the Industrial revolution, machines powered by water, then electricity, lessened the time it took to complete the grinding and polishing procedure. During a trade show, I spent a couple of hours talking to a man who introduced himself as, "The Cutter". He had worked in an Owens Corning Ford Factory. His job was to cut the Polished Plate Glass into pre-designated shapes, usually rectangles. His job station was located at the end of the factories conveyor line. During our conversation, he related how the polished plate was manufactured. The factory was a quarter mile in length. After annealing, the glass was set into a bed of plaster of paris. After the plaster had cured, the glass was sent down the conveyor line. There were a number of cast iron wheels, about 18 inches in diameter, which were lowered onto the glasses surface. A slurry of water and coarse abrasive was poured onto the glass and the surfacing process was begun. 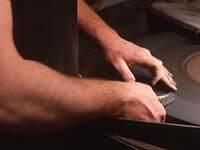 By using finer and finer abrasives, the surface of the glass eventually polished out clear. The factory was divided into two sections. The glass was sent down the quarter mile conveyor then was sent back. It had traveled a half a mile to surface only the first half of the glass. The sheet of glass was then removed from the plaster of paris, turned upside down, and sent down the conveyor to polish the back half of the glass. Most of the antique beveled mirrors came from what is termed, ""Polished Plate". Also the olde storefronts, in many historic downtown districts, had ground floor windows made of the olde "Polished Plate". I have also heard the glass referred to as "Boiler Plate Glass". The antique beveled glass sidelights, transoms, and front doors were originally made of Polished Plate or Boiler Plate. For historic restoration of these olde windows, I try to use Polished Plate glass with the same tint and thickness whenever possible.